For people wondering the cast lasts 1.7sec with this racial. Good reason to make a highmountain monk, You can mine with zen flight much faster now, meaning you don't have to land and aggro anything to get it. Druids are alright, but they have to fight stuff because you can't mine in flight form, and if herb is any indication, even if you could you'd have to land to do so. Tried this out on my Highmountain Shaman and it lets you mine at a 1.7 sec cast. I then thought hey what if I enchant the gloves too. So I tried that and went to the AH and bought it and threw it on my gloves. Mined the first ore I could find and.................still 1.7 secs. Exciting stuff blizzard. For the record, this does NOT stack with Forager's Gloves nor does it stack with Darkmoon Firewater. Mining thorium veins and ghost iron ore on a regular tauren and a highmount tauren right now with and without these items. The highmountain tauren gets 1.7 second cast, and my regular tauren gets that with the Darkmoon Firewater. There is currently a bug with this buff having its effect take over better buffs. For example, stacking Preserved Mining Pick and Peon's Mining Pick to mine in your garrison will not allow you to mine instantly like it would on other characters without the racial. Instead, you will still mine your garrison's veins at at 1.7s speed. 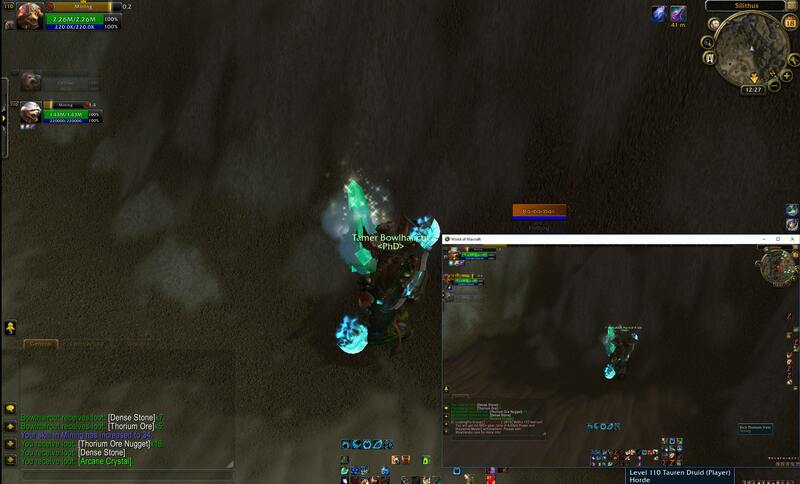 If people did not know, this actually works in Island Expediton mining the azerite goes fast. So if you got an highmountain tauren in your party let him/her mine the azerite. Mining skill increased by 15 and allows you to mine faster.